Have fun with Fat Tuesday with this sweet coloring book / activity page! Not only might you learn something about a traditional Mardi Gras treat, but you can color in your own King Cake and add your own baby! Click on the image below to be directed to a page where you can download the art in a variety of sizes! The New Orleans descendant of the French Galette des Rois, this yeast-risen cake is characiterized by its rich (usually cream cheese, praline, or both) filling and thick glaze (glaze rather than frosting is ok in this case, because of said rich filling). It crops up in bakeries after the Epiphany, and remains a stock item until Fat Tuesday (a final last hurrah before the restraint of Lent). Oh, and it also has a prize--a feve--usually a little naked baby inside. 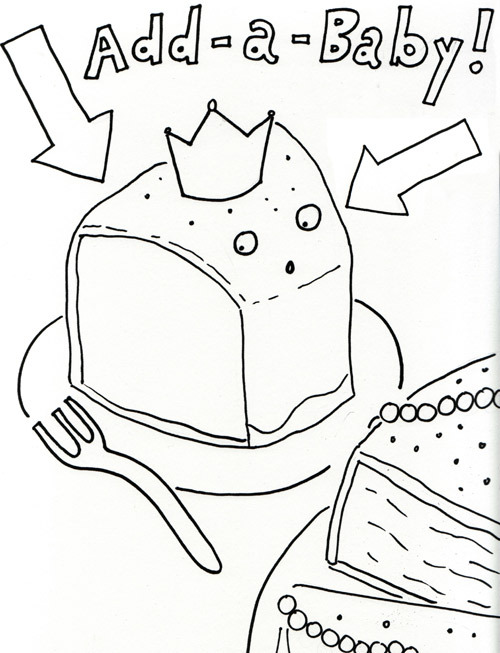 But approach prize-seeking carefully, ‘cos while whoever finds the prize is declared King, that person is assigned to buy the cake next time.